While there are many different options for promoting brands on social media, e-mail continues to be the most successful marketing platform for businesses who sell products or services online or in person. Year after year, e-mail continues to prove itself as a quick and reliable way for companies to communicate with current and potential customers. 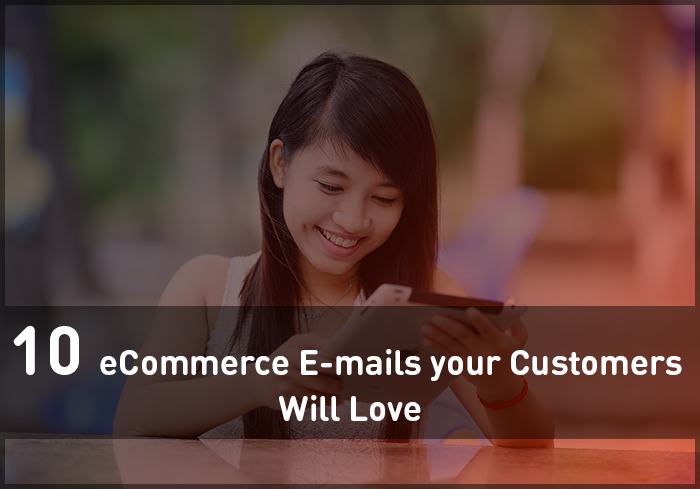 For eCommerce businesses, e-mail provides the tools needed to reach their target consumers. Whether it is a highly personalized message, information on orders, or sneak peaks of upcoming sales, e-mail is the most effective method for reaching your ideal customers. Even more critical, e-mail analytics tools make them trackable, which means businesses can determine how impactful their e-mails are to their consumers, and then use the data results to optimize results for the future. To help reach customers at the right time, and for the best reasons, here are ten eCommerce e-mails your customers will love receiving. Sending a welcome e-mail is extremely important for eCommerce brands to do. Welcome e-mails are appreciated by customers, and it gives you an excellent opportunity to provide them with valuable information, and possibly even a discount to encourage them to shop more. A genuine thank you for signing up. Your brand label mixed with a creative and catchy design. A call to action like a free gift with purchase, or a discount on a future shopping trip. Confirmation e-mails are equally as crucial as welcome e-mails. Even if you have a confirmation page on your website, sending a confirmation e-mail is essential as well. Your customers will appreciate reassurance, and e-mails are easier to save, especially for people who don’t have a printer for printing a confirmation page. Along with the confirmation e-mail, it appreciated by consumers to also receive a couple of status update e-mails. There is a fine line between e-mailing too much or too little for status updates. Typically, it is appreciated when a store will send the initial confirmation e-mail, and then another e-mail when the product ships. The e-mail letting them know their product has shipped should include a tracking number for UPS or USPS and a way for them to track their order on your website if that is possible. Confirmation e-mails tell the client you are updated on the status of their order, and take the burden of worrying or having to take the time to check themselves out of the way. Surveys are valuable to businesses because they help determine what processes are going well, and which ones need improvement. While most people may understand the importance of polls, they are often not very motivated to fill them out because they figure plenty of other people are already doing it. To help encourage people to take a survey, include a reward that is hard to pass up in your e-mail. To make an impact on your customers, send a birthday, marriage anniversary, or membership anniversary e-mail. Consumers are touched by a company remembering their birthday, wedding anniversary, or the anniversary of when they signed up for your business e-mail. If you include a discount or offer a free gift, you will encourage them to visit your site. Sending celebration e-mails is a great way to make your customers feel special while also rallying them to shop more. If you have products that are about to be discontinued, big sales coming up, or are running discount offers, sending an e-mail to the customers who subscribe to your list is a good idea. Customers enjoy finding ways to save money, and offering sales and discounts is a great way to get people to visit your site and shop the sales. While on the topic of sales and discounts, customers are particularly drawn to exclusivity e-mails. Sending e-mails that offer a discount or exclusive deal just for them are enticing. Sending exclusivity e-mails is another excellent way to help your customers feel special. There are many reasons for why a person may fill up their shopping cart and then not make a purchase. Whether they got pulled away, had technical problems, or faced any other issue, your business can show they care and encourage a sale by sending a cart abandonment e-mail. Send an e-mail that has a list of the items they left in their cart and encourage them to get back to them when they can. When someone has a full cart and then has to stop shopping, it is very discouraging if they go back to their cart and all of the items are gone. In case the cart empties, sending them an item list gives them something to go off of when they are able to return shopping. If a customer was trying to make a purchase and ran into technical issues, they may not reach out for help but will instead take their business elsewhere. If you send a cart abandonment e-mail, it is a good idea to post customer service contact information. Searching for customer service information online can be difficult, and many people shy away from doing it because they view it as a hassle. If you send it to them in an e-mail, not only will they be impressed by your concern, there is a better chance they will reach out for help. When a product has been delivered, it makes a huge impression if a business sends an e-mail to announce the product and to encourage contact if the order isn’t exactly what they were expecting. If you want to show you genuinely care about your customers, and have faith in your products, your e-mail will announce their new product and include contact information to make it easy for them to reach out if they have any problems. For customers who haven’t shopped your store for a while, sending an e-mail to let them know you miss their business is an excellent way to encourage them to visit. Even more, if you include a discount or free gift option, your consumers will have even more incentive to visit your store, where you can be set up to encourage them to make a sale. While you don’t want to inundate your customer’s inboxes with e-mails, a well-timed e-mail that gives them recommendations can be helpful. The recommendations sent in the e-mail are based on the previous shopping habits of your consumers. Launching a product or business is exciting, and you will find yourself highly focused on selling. It is not a bad thing to be sales focused, but it is equally important to understand that sales won’t happen without customers, and continued business won’t happen without loyal consumers. It is essential to understand the what your customers expect. Once you know the nature of your consumers, you can build an effective e-mail strategy that will meet their expectations. Making people feel special, keeping them informed, and finding ways to make their lives easier are great ways to encourage sales while also building trust. E-mail is an excellent way to reach your consumers. It is critical to find a balance between keeping your customers informed and overwhelming their inbox. Your consumers will gravitate to your store if they feel positive about your brand. E-mail is a great way to make that happen. Christy Bohrer is a multi-topic blogger, with a passion for all things marketing and social media. She is a wife, mother, and entrepreneur. In her spare time, she enjoys traveling, language, music, writing, and unicorns. Christy is a lifetime learner, and loves to spend time attending classes, webinars, and summits.